Initiated as a small scale industry our organization has established a remarkable identity in the domestic as well as international market over the years. Stated as a manufacturer of Mild Steel Electrodes we progressively developed all sort of metallic electrodes during the past years. We are also involved in developing turnkey projects machines and equipments. We take immense pride to announce that more than 26 such systems are serving the Indian Industry for the last fifteen years. We are associated with the vendors who are committed to provide high tech machinery and raw materials to keep up strict delivery schedule. These is a team of experts in our manufacturing unit who keeps day-to-day production planning & research to develop and feedback to update the technology in machine building as well as product specialization. Our well equipped manufacturing unit, sound infrastructure and developed administration help us to develop a qualitative range of products that incur low cost investment. Initiated as a partnership company, Eureka Systems and Electrodes grew into a Private Limited Company in the year 1989. Entrepreneurs with proven talents and stalwarts in their respective fields like paper and textile exports found common ground in contributing a sizable share of the venture capital and became directors. It was the beginning of the real growth of the company. Their unstinted support elevated Mr.K.Chandrashekar as Managing Director and Mr.S.Ganesan as Technical Director. The company moved into its own premises fully equipped with Chemical, Physical and Welding Labs. Our state-of-the-art Manufacturing Unit in SEZ, Perundurai, India is fully equipped with all essential machines and equipment to meet our production, inspection, testing and storage needs. Apart from the dynamic managerial team and middle management, we utilize services of around 20 skilled techninicians and an equal number of semi skilled workers. With a fully computerized administrative office, centralized purchases as well as production and marketing are monitered by the Director himself. Today we at Eureka Electrodes and Wires Private Ltd, are a formidable team with unsurpassed professional excellance and world class caliber ready to take on new challenges. With a vision to globally merchandise the expertise earned after serving in various welding based industries with mechanical and metallurgical credentials, the investors/promoters joined hands and formed a Private Limited Company EUREKA ELECTRODES AND WIRES PRIVATE LTD. with “ELWI” as a corporate identity. The promoters believed that state of the art technology with quality consciousness and the urge for customer satisfaction can reach the pinnacle. Since the focus market is targeted beyond borders the promoters decided to have the Registered office and facility in a free zone area and thus located a SPECIAL ECONOMIC ZONE FOR ENGINEERING in Perundurai, Tamilnadu, India to put up its state of the art facility for manufacturing welding consumables such as welding electrodes, welding wires, etc. and manufacturing, fabricating & assembling welding electrodes projects. The unit has been approved by MEPZ to start its activity on 9th June 2009. 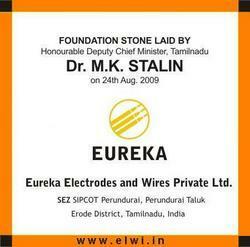 The foundation stone has been laid by the Honorable Deputy Chief Minister Thiru M.K.STALIN on 24th August 2009. The commercial production started on 24th June 2010. Enabled with various modern machines and sophisticated range of equipment, we are capable of generating high volume of output throughout the year. Large scale of electrodes, wires and other mechanical machineries are produced annually in our site. Besides, our team of professionals and experts help us in producing optimum throughput around the year.